In 1856, the Sisters of Our Lady of Charity of Refuge took up residence in a house known as High Park on Grace Park Road, Drumcondra, at the north side of Dublin. 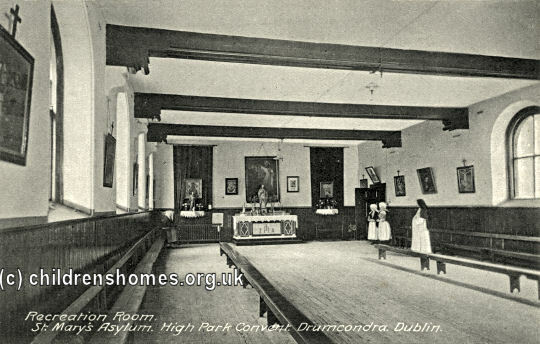 The Sisters, originally based in France, had arrived in Dublin three years earlier to take charge of the 'Mary Magdalene Asylum' at the Sacred Heart Home on Drumcondra Road. 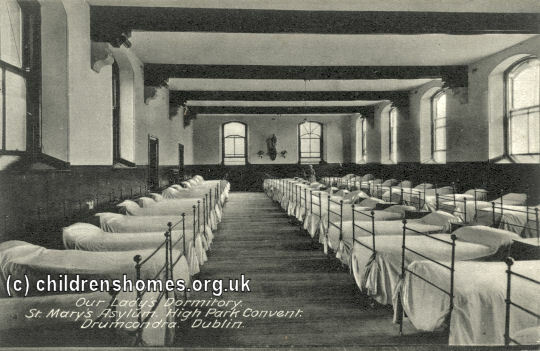 Their new High Park convent, situated in fourteen acres of grounds, was to form the hub of two major institutions: the High Park Reformatory School for Roman Catholic girls whom magistrates had committed to a period of custodial detention, and St Mary's Magdalen Asylum for what was viewed as the rescue and rehabilitation of 'fallen women' and former prostitutes. The foundation stone for St Mary's was laid on July 3rd, 1858, by the Very Reverend Dr Bartholomew Woodlock, President of All Hallows College, standing in for the Archbishop of Dublin who was unavoidably absent. 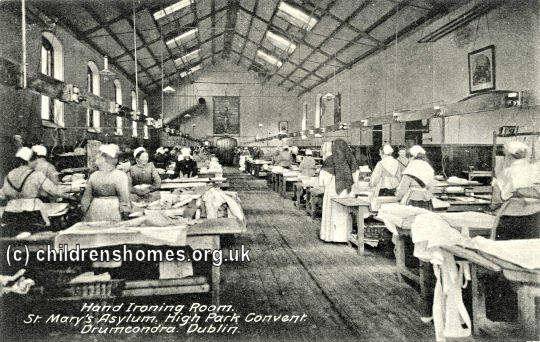 The institution (also known as St Mary's Penitentiary or Magdalen Home) could accommodate 210 women and girls and was one of the largest establishments of its kind in Ireland. The St Mary's girls were employed in laundry work which, apart from its symbolism of cleansing and purification, generated a valuable income to help pay for the institution's running costs. St Mary's Asylum laundry ceased operation in 1991. As shown on the above map, a burial ground was located to the west of the Asylum building. In 1993, when the Sisters decided to sell off some of the land, they applied to the Department of the Environment for permission to exhume the remains of 133 women from unmarked graves. When the bodies were exhumed, on 23rd August 1993, a further 22 remains were discovered and the Sisters applied to the Department for an additional exhumation order. It later transpired that the Sisters had not been able to produce death certificates for 24 women on the exhumation orders and that fictitious names had been given. The remains of 154 women were eventually recovered, cremated and then reinterred at Glasnevin Cemetery. In the public outcry that followed, revelations began to emerge about the decades of cruelty and abuse that had taken place at the Asylum and others like it. After the St Mary's part of the site was sold, the old Asylum buildings were demolished. The Grace Park Manor apartments, completed in 2000, now stand in their place. In 2014, the former convent/reformatory and chapel buildings in the northern part of the site were being redeveloped for residential and community use.